The US Solar Market Insight: Q3 2013 report just recently showed us that the US has hit record solar growth this year, and that comes from the cheapest solar panels on record. However, expect 2014 to be an even bigger year. Market research firm IHS projects that solar panel prices will fall another 10% globally next year. 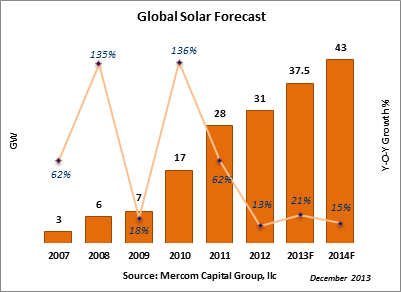 Meanwhile, Mercom Capital Group, another leading market research firm, projects that the US will reach approximately 6 gigawatts (GW) or so of new solar PV capacity. That would be considerably more than the 4 GW or so that the US has installed in 2013. It’s also a bit more than the 5.5 GW or so that GTM Research projects will be installed in 2014, which is still a big projected increase. However, the US won’t be leading the tables. Just as it is coming in third behind China and Japan this year, it is projected to come in third again in 2014. 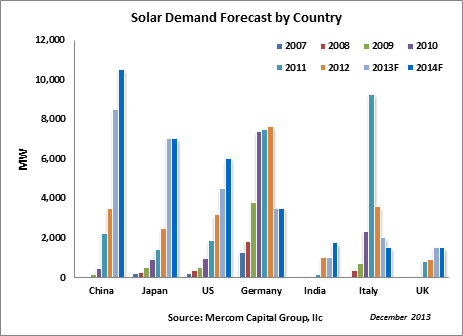 While the US is projected to installed a record 6 GW in 2014, Mercom projects that Japan will install 7 GW next year (about what it has installed this year) and that China will install a global record of 10.5 GW. The red giant actually has a goal of installing 12 GW, but not many in the industry are confident it will hit that target. In total, another solar market research firm, Solarbuzz, projects that the Asia-Pacific region will install approximately 50% of the world’s new solar power capacity in 2014. Overall, though, the projected global total shows how much the solar PV industry has diversified: a record 40 to 45 GW of solar PV will be installed in 2014 according to IHS, while Mercom similarly finds that about 43 GW will be installed, enough to power over 6 million households. All in all, it’s going to be a banner year for solar. If you haven’t gone solar yet, it’s about time — join the rooftop revolution!